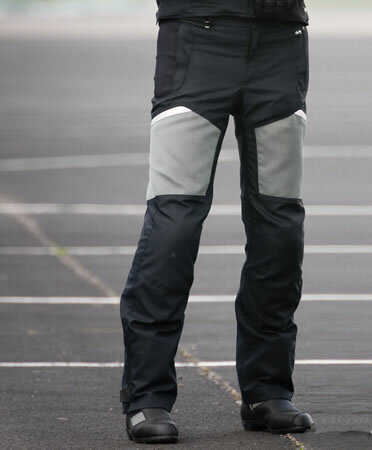 The AirFlow suit is a summer-only suit for touring riders. Intended to be worn in summer temperatures, the non-waterproof AirFlow is ideal for long trips and as a second suit to wear when your 3-season suit is too much. Features excellent ventilation through AirTex mesh inserts for wear comfort that’s not unlike a T-shirt while riding while still providing a tough shell and and protectors for safety. The functional “coldblack” finish of the black version prevents the material from heating up in the bright sun. 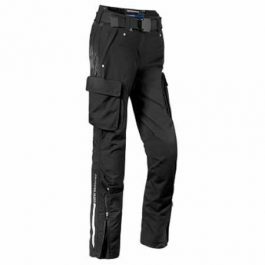 AirFlow Pants idea for touring riders especially during hot summer days. Height-adjustable knee protectors to accommodate your leg length. The shell material is highly abrasion-resistant Dynatec. AirTex mesh inserts at thighs for optimum ventilation. 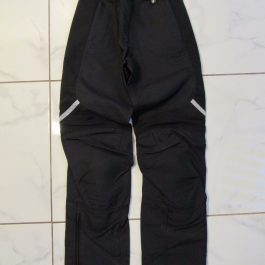 “Coldblack” finish for the black version prevents pants from heating up due to bright sun. Eyelet functional lining is extremely air-permeable and elastic. Removable NP2 protectors at thighs. Removable, height-adjustable NP2 protectors at knees. Retro-reflective material on pants. Velcro for adjustment at trouser cuffs and waist. 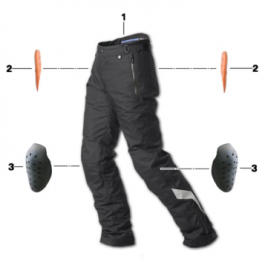 Be the first to review “Ladies AirFlow Pants” Click here to cancel reply.